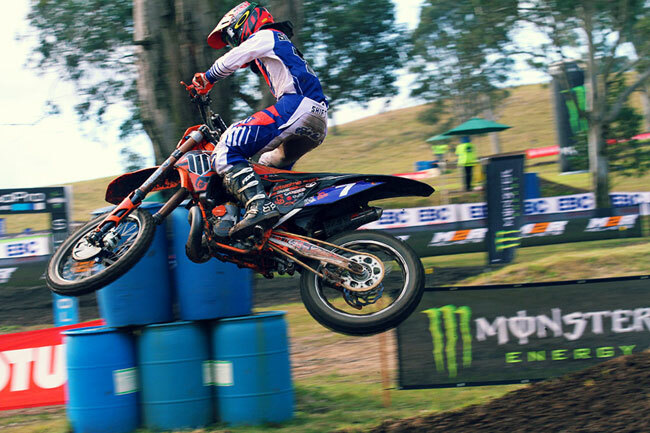 Matt Moss, Styke and Simpson victorious at Appin Australian Motocross round. Cooper 2nd. 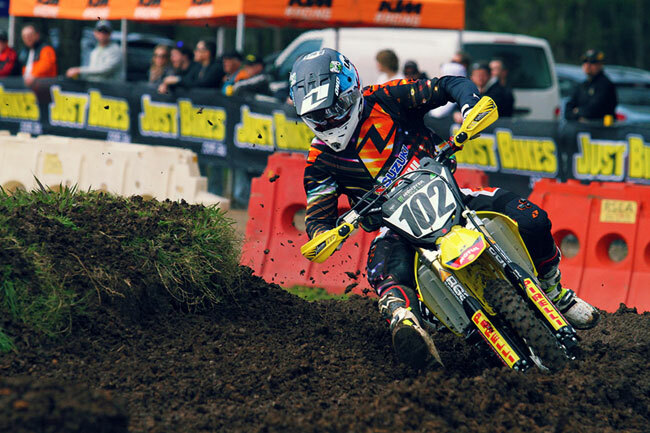 Motul Pirelli Suzuki’s Matt Moss raced to his second Monster Energy MX Nationals, Australian Motocross Championship, round victory of the year as the season resumed with round six at Appin’s Macarthur Motorcycle Club today. Click here for the race highlights. Fresh from a month-long trip to the US training for the series’ second half, Moss claimed the overall round win with 1-3 results and now closes to within four points of MX1 championship leader Todd Waters (Motorex KTM), who finished 10th overall. Moss was up front from the outset in the opening 30-minute affair, controlling the pace and comfortably winning in what is his home race of the season. Race two saw Moss forced to battle from the back-end of the top 10, climbing to a hard-fought fifth despite a mishap mid-moto. A second moto win for Cody Cooper resulted in second overall, handing Motul Pirelli Suzuki its second 1-2 result in succession. Cooper’s ride in moto two was clinical as, like Moss earlier, he controlled the race at the front from early on and was never headed. In moto one Cooper was a frustrating eighth after a number of incidents. Matt Moss took his second overall MX1 win of the season. Image: Simon Makker/Makkreative.com. Completing the podium overall was rookie Kirk Gibbs (Motorex KTM), taking a well deserved second in the first moto after suffering arm pump and fourth in moto two. The South Australian was tied with Cooper, but dropped to third on count back for his second podium of the year. CDR Yamaha’s Lawson Bopping ended up fourth for the round with a consistent effort of 4-6, while Adam Monea (Monster Energy Kawasaki) was again impressive to complete the top five. Monea crashed in the first turn of moto one and again later in the moto on his way to 12th, but salvaged his weekend with a gritty ride to second in moto two. Scotsman Billy Mackenzie (CDR Yamaha) had a difficult opening moto with 10th, but soldiered to third in moto two and retains third in the standings. He edged out four-time champion Jay Marmont (Monster Energy Kawasaki), who was seventh with an improved 5-7 results haul. Campbell Mining Suzuki’s Jake Moss was a fine third in moto one, but a crash and difficulty getting going again during moto two forced him to settle for 12th. That resulted in eighth overall for the round, one spot ahead of a rejuvenated Cody Mackie (Zero Seven Motorsports Kawasaki, 6-9). Waters completed the top 10, braving the pain of a freshly broken collarbone that he underwent surgery on less than a fortnight ago. The first moto was kind to Waters with a seventh, but a fall in the second outing halted his progress on the way to 11th. In the Motul MX2 category it was Serco Yamaha’s Luke Styke who extended his series lead in the most pivotal round of the championship to date. Styke was second in the opening moto, before putting forward a dominant performance in the second for the race two and overall victory. With teammate Luke Clout ruled out with a broken femur sustained in a practice crash late this week, the big news came following moto one that Josh Cachia (Carlton Dry Honda Racing) will also be ruled out of the season as he undergoes wrist surgery on Monday. Luke Styke took the MX2 overall win at round six. Image: Simon Makker/Makkreative.com. Moto one saw Tunetech Racing KTM privateer Kale Makeham breakthrough for his first career win in a stunning ride, backing that up with a come-from-behind third in moto two. That sealed him the runner-up for the weekend in his third podium appearance of his rookie campaign. Makeham’s result moves him to second in the series, 83 points in arrears of Styke. “I didn’t get the best of starts in that second one which was a bit disappointing,” said Makeham. “I had so much fun when I got to the front with the top boys, it’s always been on my mind to be able to battle with those guys. Completing the podium in the ride of the weekend was Victorian Kade Mosig (Zero Seven Motorsports Kawasaki), returning from injury in another exceptional effort. Mosig was a comfortable third in moto one and second in moto two, resulting in his first rostrum of 2013 despite missing the past two rounds. 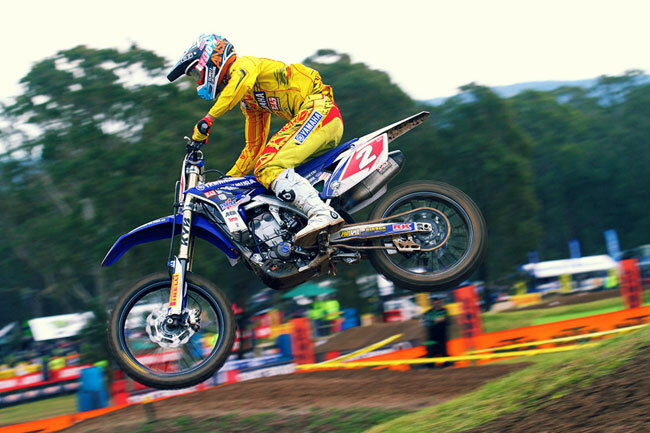 The MX2 class was action-packed at Appin. Image: Simon Makker/Makkreative.com. Fourth overall for the round was Geran Stapleton (Raceline Pirelli Suzuki) with a pair of fourths, edging out Kiwi Suzuki privateer Rhys Carter after he raced to a 6-6 scorecard. Shell-supported Honda rider Takeshi Katsuya put in one of his best rides of the season with sixth overall. He was ninth in moto one, before charging to fifth in the second despite falling early on in the moto. The top 10 was completed by Ryan Marmont (Raceline Pirelli Suzuki, 7-7), Brock Winston (Choice Motorsports KTM, 8-10), Keiron Hall (Full Force CarsRus Honda, 12-9) and Wade Hunter (Suzuki, 10-11). Victorian rising star Jack Simpson (KTM) returned to the top step of the Pirelli MXD podium in convincing fashion at Appin, rebounding from fourth in moto one to win the second moto. He’s now 19 points behind series leader kiwi Hamish Harwood (KTM), who was third at Appin with 2-4 results. Jack Simpson took the MXD overall win at Appin. Image: Simon Makker/Makkreative.com. Harwood was content with his overall result, happy to hold onto the red plate at the point of the season. Second overall was GYTR Yamaha’s Jay Wilson in his best outing of the year. Wilson was third in moto one and again in the second, climbing from outside the top 20 in that second moto. Rounding out the top five for the weekend was Jesse Dobson (Kawasaki, 10-2) and Joel Whightman (Yamaha, 6-7). The hard luck story of the weekend was Wilson’s rookie teammate Joel Dinsdale, winning moto one before crashing out of the second and bumping his head in the process. Early reports indicate the young Queenslander has no broken bones. Former Under 19s champion Errol Willis won the KTM 2-Stroke Cup overall with a 1-1 scorecard, heading local standouts Dwayne Stadthaus (KTM, 3-2) and Corey Lucas (Suzuki, 2-3). The Monster Energy MX Nationals will continue at Hervey Bay in Queensland on Sunday, 28 July. 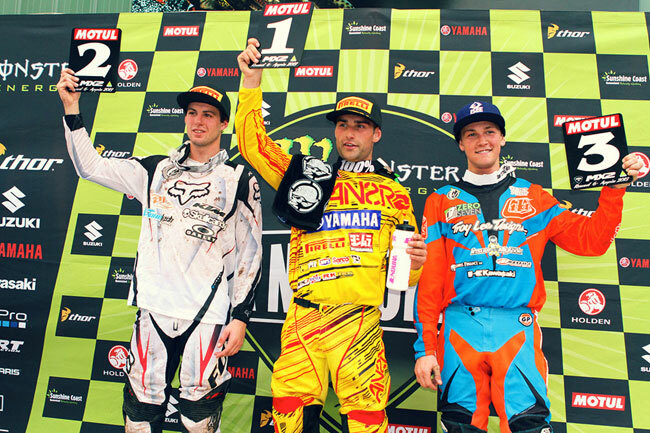 Top photo: Matt Moss, Cody Cooper and Kirk Gibbs stood on the MX1 podium at Appin. Image: Simon Makker/Makkreative.com.